Taxpayers are footing the bill for thousands of cheaters who ride Los Angeles’ growing subway system for free, an NBC4 I-Team investigation finds. Taxpayers already subsidize most of the fares for commuters who pay. The Metropolitan Transit Authority is about to implement a plan to stop these fare evaders. But the government’s plan might not stop a lot of cheaters. Commuters are supposed to buy a TAP card and load it with enough money to pay their fare -- $1.50 for regular fare; 55 cents for passengers who are seniors, disables or eligibile for reduced fare. They then tap it on the turnstile and, when a green light flashes, they’ve paid. Otherwise, a red light goes off. 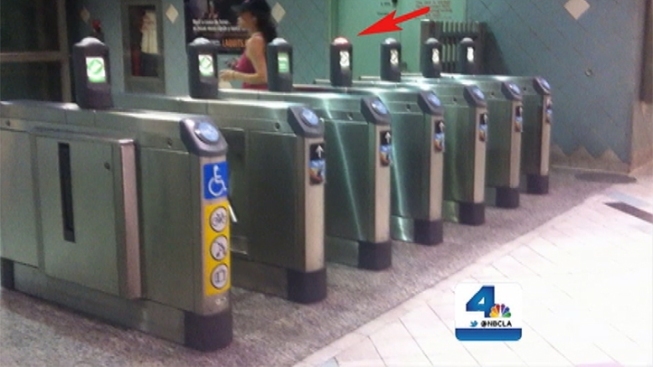 Video from the Hollywood and Highland Metro station shows several commuters breezing through the turnstiles without paying, and some of them used the turnstile for commuters with disabilities. One commuter said he skipped the fare because, “I don’t have any money right now.” He added that he feels badly about not being able to buy his ticket. There’s no way to tell just how many commuters get a ride free, according to transit officials. Paul Taylor, with the Metro Transportation Authority, said on June 19, Metro will start latching the turnstiles on the red and purple lines. If commuters don’t pay, the gates won’t open. But Metro’s former chief financial officer thinks the agency is wasting an untold amount of money to lock the turnstiles. Other lines, including the Blue and Gold lines, will remain on the honor system. Riders are supposed to buy a TAP card, but there are no turnstiles. That loophole infuriates rides, like Charley Santangelo, who say they always pay. “The idea of having a large city on an honor system just makes no sense,” Santagelo said. There are a handful of sheriff’s deputies who spot-check the subways to make sure riders pay, but Rubin thinks there should be paid guards posted at all station. “The message is, we’re here, we’re watching, and we want to help you do it right,” Rubin said. Taylor said that’s a possibility. But until then, much of LA’s rail system could be vulnerable to commuters who don’t want to pay.